When communication skills are vital ! Recently, I watched a documentary called Enron: The Smartest Guys In The Room and I realised how much a PR intervention may have saved thousands of investors out or pocket and billions of dollars in unassailable debt. In a perfect world, a crisis communication plan early on could have turned Enron into a small company, but into it’s eyeballs in corruption and debt. Except in real life, for Enron, making money by any means necessary was the name of the game. The potential stage: The moment in a business in which something bad might occur. 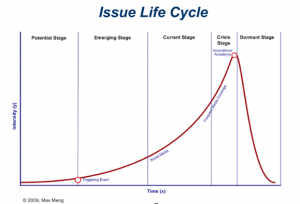 Dormant Stage: When the crisis loses traction with the media, depending on how well the crisis is handled determines how long this issue lingers on in the company. Enron managed to influence various state governments to deregulate the energy industry. During the time of deregulation, Enron hid all of it’s debt through mark-to-market accounting (failed ventures were seen as assets in Enron’s books), market manipulation and making companies solely to purchase Enron’s debt. The corporate culture at Enron was to make money for the company by any means necessary. They bribed auditors Arthur Anderson to stay quiet on the issue and it was speculated they bribed banks and lawyers. Enron also encouraged citizens to put their retirement funds into the company knowing that the company was a sinking ship. In 2000, Enron’s stock was selling at more than $90 per share, By the December 2001, Enron’s stock was 26 cents per share, went from 84 billion dollars to bankruptcy in 21 days and citizens lost their retirement money. Arthur Anderson also failed due to corruption and major Enron employees were sent to jail for fraud and other white collar crimes. Using case studies like this can help anyone working in crisis communication if a similar situation like this arises. Now as a crisis communicator, the easiest and best way to resolve an issue is at it’s earliest possible stage. The Potential stage happened when states were deregulating the industry. This freed Enron to be more flexible with their business practices and increase the likelihood of corruption. Having a trusted professional would have helped by informing Enron of the potential long term consequences of corruption that can come from market deregulation. That way they are aware of the potential situation and may have been more vigilant against potential corruption. The triggering event was, when Jeffery Skilling became CEO and began implementing mark-to-market accounting. This was what started the cascade of imaginary numbers, artificially inflated stock prices and market manipulations to cover their losses. The emerging stage is more difficult to pinpoint. The emerging stages would have occoured when Enron hit insurmountable debt. 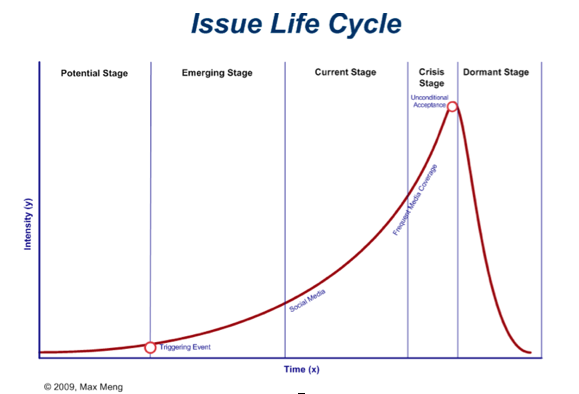 The emerging stage is when an issue starts to spin out of control and it takes a lot of PR in an attempt to stop it. At this stage, there is no chance of Enron (or any company) escaping the damage. A crisis communicator could have mitigated it by advising Enron to declare bankruptcy and have a PR campaign detailing how and why the bankruptcy occurred and methods of repayment from investors. This may have gotten Enron staff members indicted for white collar crimes, but they whould have been able to reduce the level of bankruptcy and saved workers their retirement money. People may have looked back on Enron far less negatively than people do today. The crisis stage started when skilling retired from Enron two months before the financial collapse and the crisis peaked when Enron became officially bankrupt. It was at this stage when Enron decided to handle it by constantly denying any wrongdoing and avoiding the situation they set themselves up for instead of admitting outright that what they did was business malpractice. So, as a crisis communicator, think about these 5 stages of crisis management from the communication viewpoint. It’s an interesting consideration. Previous Previous post: The Importance of Communication when the Business is attempting to adapt to Change.